No need to move over - this is a recliner with room for two! Handcrafted to order and boasting two individually reclining seats in one perfectly-sized package, the American Mission Reclining Loveseat is an upholstered living room essential that promises to bring long decades of deep comfort and happy memories to the home. Whether relaxing alone or with a loved one, this exceptional reclining loveseat makes sure that everyone has the chance to spend their time together in ideal comfort. 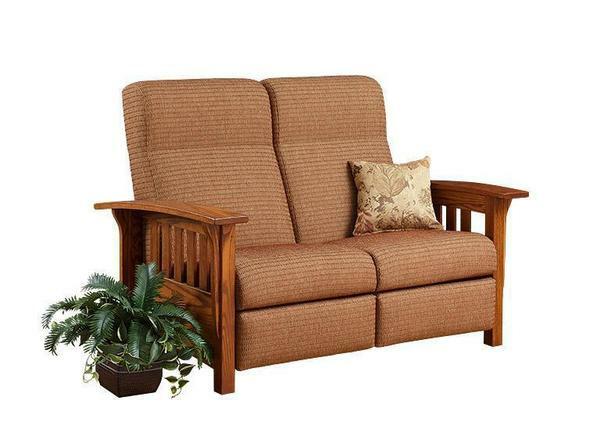 Use the menus above to choose the perfect wood, stain, and fabric or leather for your reclining loveseat. Every single element of this piece will be handcrafted to order by dedicated Amish woodworkers with decades of experience behind them, ensuring that the American Mission's construction, sanding, finishing, and upholstery are crafted to a level of quality that mass-produced pieces just can't hope to match. If you have any questions at all, or if you would like to talk about further customization, please don't hesitate to get in touch with us by phone or by email at any time - we love the way this loveseat brings individual comfort to the family room, and we would love to talk with you about making it perfect for the home.